Fomes fomentarius. Photo: Paul Kirtley. Fomes fomentarius is a bracket fungus, more commonly known as Hoof Fungus or Horse’s Hoof Fungus. It is also known as the Tinder Bracket. Confusingly, Fomes Fomentarius is sometimes referred to as False Tinder Fungus. There is nothing false about the usefulness of Fomes fomentarius as tinder. In fact this fungus can be prepared into first-rate tinder. 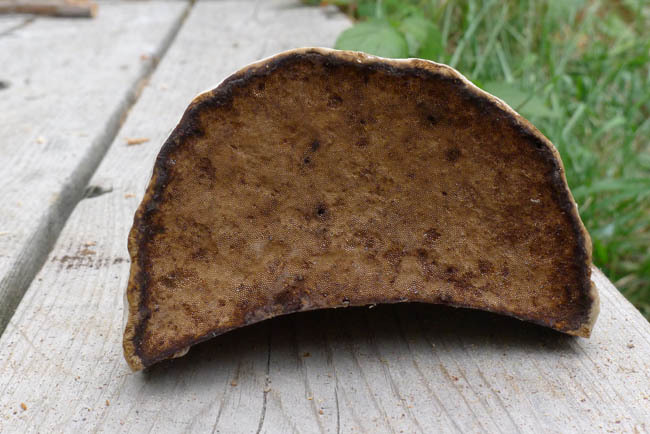 The term False Tinder Fungus is used to differentiate it from Inonotus obliquus, sometimes called True Tinder Fungus and also known variously as Chaga, Birch Conk or Clinker Polypore. 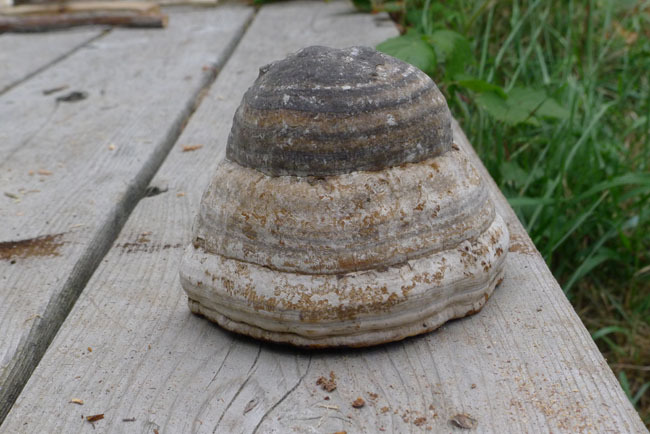 Fomes fomentarius occurs throughout much of the northern hemisphere. It grows on various species of trees. At more northerly latitudes the brackets are usually found growing on dead birch (Betula spp.) Further south the fungus is often hosted by beech (Fagus spp.) The brackets are the fruiting body of the fungus and are perennial. They grow slowly, adding a growth ring each year, and can live up to 30 years. The use of Fomes fomentarius for tinder has been known for a millennia. Ötzi the iceman had pieces of Fomes fomentarius amongst his belongings, possibly as tinder. There are various processes for preparing or improving Fomes fomentarius as tinder, including producing amadou. Tinder produced in this way will catch and hold the small, relatively cold sparks produced by striking together flint and iron pyrites. In concentrating on these more involved processes, it is possible to overlook the simplest and easiest preparation of Fomes fomentarius as tinder. This can be done quickly in the field and the tinder produced can be used immediately. The bracket is the fruiting body of the fungus and its outside layer is hard, like the crust of a stale, dried-out loaf of bread. Observing the underside of the fungus you will see many pores, which are the ends of the spore tubes. Underside of Fomes fomentarius showing pores. Photo: Paul Kirtley. Inside the bracket, between the spore tubes and the outer layer is the trama layer or “flesh” of the fungus. The trama layer of Fomes fomentarius is quite dense, firm in consistency and has a cinnamon colour. Within the trama you will see growth rings. You can see clearly see the structure of the bracket by slicing through it. Fomes fomentarius cross section, showing trama and pore tubes. Photo: Paul Kirtley. Whichever process you are using to produce tinder from Fomes fomentarius, it is the trama you need to start with. If you slice the trama thinly, you will notice that it is somewhat fibrous. This is easiest to see at the end of your slice. Fomes fomentarius cross section and slice of trama layer. Photo: Paul Kirtley. For our simple method of producing tinder from Fomes fomentarius we will make use of the fibrous nature of the trama. Slice off the surface layer of the fungus. Then slice the trama obliquely to create the largest possible slices. 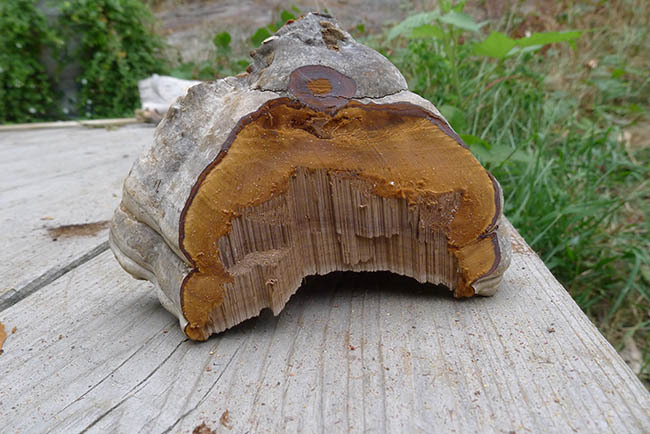 Slice of trama of Fomes fomentarius. Note growth rings and fibrous nature of the material. Photo: Paul Kirtley. To prepare the trama as tinder, we need to scrape up the surface of the slice. Using a knife or other sharp implement is the easiest way to do this. Scrape up the surface until you have a bunch of fluffy material. Fomes fomentarius, trama layer prepared to take a spark. Photo: Paul Kirtley. Now all you need to do is drop a spark into the fluffy material. This fluff is very good at catching a spark and once ignited will smoulder for a while. Fomes fomentarius tinder smouldering after receiving spark. Photo: Paul Kirtley. The smouldering will spread into the remainder of the slice. This will then smoulder for a long time. This combustion is remarkably hot. The material will not flame, however. Therefore to light a fire via this method you must then take your smouldering tinder to very fine kindling to produce a flame. Examples of natural materials suitable for this include dried grass, dried bracken fronds or properly prepared bark fibres. Piece of Fomes fomentarius, smouldering and hot. Photo: Paul Kirtley. Once ignited, a larger lump of trama can smoulder for hours and can be used for carrying an ember or rekindling a fire at a later stage. Because the fruiting bodies of Fomes fomentarius grow so slowly and can live many years, please show restraint in collecting them. Areas take a long time to recover from over-exploitation. Take only what you need. Brilliant! I’d been put off experimenting with Fomes fomentarius because of the faff involved in producing amadou. I’ll just get on with it using your straight forward method. Thanks Paul. Good to hear that the article has you enthused. Let us know how you get on. I’ve tried this before with flint and steel but found it reluctant to ignite without more processing. Am I right in thinking this was lit using a ferro rod? Yes, the cooler the spark, the harder it is to light without processing. The tinder in the pictures in the article was ignited with a Swedish Firesteel. I think it would have lit from a flint and steel without further processing on this occasion though. But I didn’t have a set with me while I was in Canada. The tinder caught a small spark from the Firesteel extremely readily – more readily than usual. The fungus was in excellent condition and, straight off the tree, it was very dry. There had been a good dry spell before and everything was quite dessicated. The more damp/humid the conditions, the harder this material is to light with lower temperature sparks. As you rightly point out, the Firesteel is the most reliable method. Finally a good article about the use of this mushroom. Many articles only tell it can be used but never how. Took me some research a few years ago. Thanks for your comment. It’s hard to find good information on some subjects. I hope people find this article useful. Ive seen these many times on the Birch here in BC. And once i even took one off, but it did not look like this inside ?. Could it be that it doesn’t happen here in BC ?. Or should it be a certain size ? Thanks for commenting. The example depicted in my article is a good one. They brackets do vary. They do eventually die off too. Sometimes they can be old and rotten inside when you take a look. One I examined the other week was full of grubs, eating away at it. Ok, i will continue to look for a ” good one ” as there are tons of them. Im bound to find one that’s just right. Hi Martin, thanks for your comment, it’s nice to hear from you. I won’t be expanding this particular article with other processing options. I really do want to keep it focused on ‘the easy way’. I think processing should form a separate, future article. With this article I wanted to generate more positivity about using F. fomentarius ‘straight out of the box’, as it were. You were the instructor on my Intro to Bushcraft course and the steel striker and char cloth realy stuck with me. First thing once back home was getting a steel, finding suitable flint and making my own char cloth. Amadou was my next progression with mixed success. 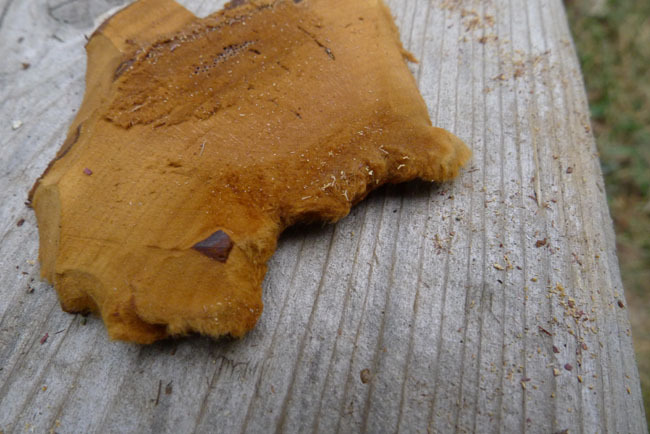 Welcome back…..As the theme of article suggests there is an easier way to ‘process’ False Tinder Fungus. I have never bothered because of the in depth processing that I believed was required and a lack of the raw material down here in the South West. The abundance of Cramp balls (Daldinia concentrica) has meant they have always been my first choice for Fungi and Fire preparation. I have found plenty of Artist’s Fungus (Ganoderma applanatum) on Beech trees , but no Horse Hoof. Are there any other Fungi which offer a Trama layer ? Are there any guides to Fire and Fungus ? Thanks Mark. I don’t know of any good guides to fire and fungus. There are just bits and pieces here and there and some things I’ve not seen written down anywhere. Many fungi have trama as it is just the ‘flesh’ of the fungus see here for more info. The question is whether the trama of any other fungi are suitable as tinder. There are some other bracket fungi that can be processed to produce tinder. Artists Fungus is amongst them. I’ll try to cover this in a future article (it’s a question of me getting some good photos). Thats another one for my list of things to try. Would a very simple way to ensure this works be to collect some of the Trama layer, slice it thinly then leave it somewhere warm to dry? Not ideal for a quick fire start i grant you but ideal for a future source of tinder. Or would it just become too brittle? Once the trama is sliced it should remain flexible, even when dry. It’s reminiscent of a soft suede leather. Very good post, and well documented with pictures. Articles like these make us all want to go out and try it for ourselves. Nice article, I’ve noted some of the questions above, and as a mycologist the many uses of fungi fascinate me. I will do some research into which fungi contain similar trama in large enough quantities to be of use to ush bushcrafters. One I can thoroughly recommend not mentioned here is the giant puffball, Clavatia gigantea, edible when white throughout, and very good at catching a spark when mature and brown. The flesh is even fluffier and the entire body is of this fluffy material, no spore layer. Thanks Tony. I’ll certainly be interested to hear the results of your research. As for giant puffballs – yes, very eidble and one of my favorites, sliced and fried in bacon fat for breakfast (with the bacon). Next time I find one that has gone over, I’ll give lighting it a go – something I’ve never tried. Thanks for the tip! Do you have a suggestion for how to make amadou? I very much like the idea of knowing just one material really well to solve multiple problems (and also having several ways to solve each problem). That way I have the most flexibility in using whatever is at hand. In the woods, tinder is seldom in short supply. What can be in short supply is DRY tinder. Otzi knew what he was doing … and carried a supply – already dry – with him. Yes, Otzi had a neat kit. 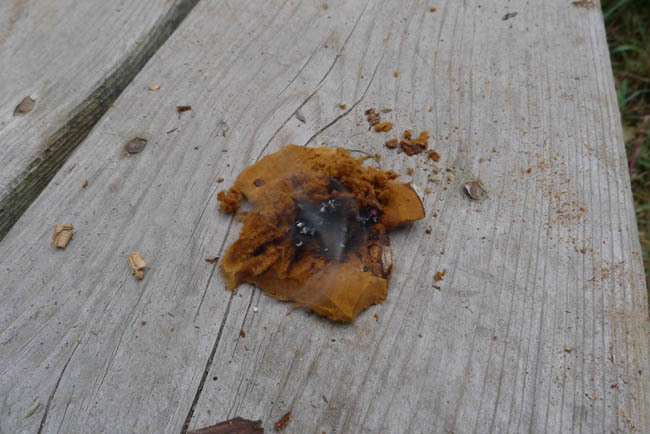 In terms of making amadou/improving fomes’s ability to accept a spark, you should take thin slices of the trama layer of the fungus and boil them up in an alkali solution. The easiest way to create such a solution in the woods is to take a good amount of ash from your fire. Once soaked, you can pound and flatten the material further. This should then be dried. Scraping up the surface to a fine fluff will increase the materials willingness to accept the tiniest of sparks (for example from flint and iron pyrites). In this state it is pretty difficult with flint and steel. If it is good and dry and the atmospheric humidity is not to high then it can work. It is much more reliable when it has been processed by soaking in an alkali solution (can be made with wood ash from campfire) and then punded and dried. Fluff it up with a sharp edge to increase chances of catching a small spark. I’m interested to know if there are bracket fungi with similar properties, I have recently looked in my local woods and found Southern Bracket fungi and was wondering can it be processed in the same way, although I imagine it to be less effective. Hi Shiver, quite a few bracket fungi are improved by processing in a similar way to producing amadou. Salt Petre will make others (eg birch polypore) strike up very easily. Chaga Birch. How to find a butcher to use medicinal properties. 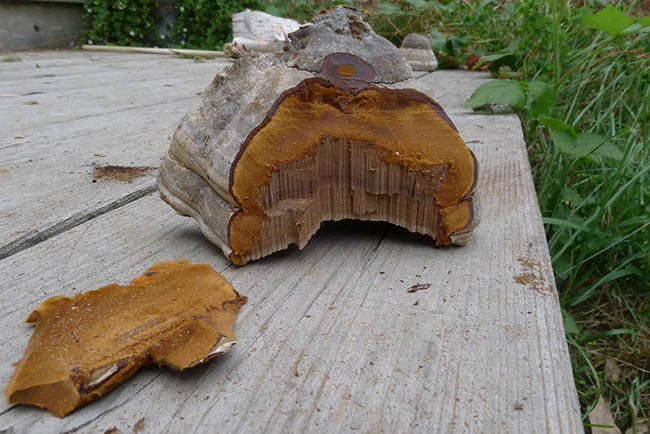 Chaga Mushroom – birch fungus against the 100 diseases. Brilliant article as always, I’ve been looking for it for ages but I think I’m a little far south! 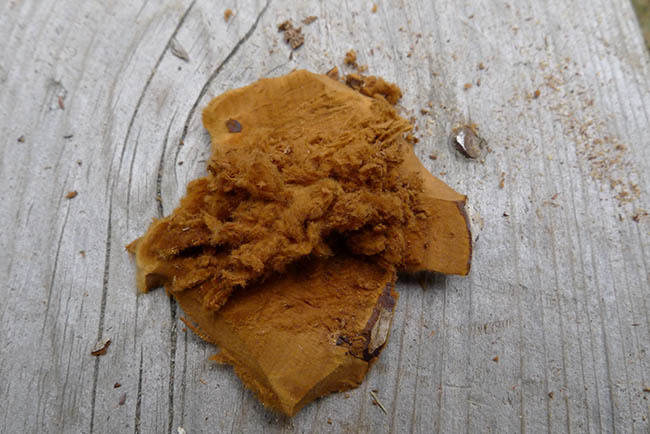 In the article you say that another name for the horses hoof is chaga? I was under the impression chaga was a large black growth like fungus? Hi Denny, glad you liked this article. Whereabouts are you based? PS the mention of chaga was that it was different but sometimes referred to by similar names. Hi Paul. I’ve been using a large bracket fungus growing locally in Yorkshire with dark brown trauma. I think its Ganoderma adspersum and its very prolific round these parts. After searching for about six years I found some locally growing Formes Formentarius on a dead birch log. I want to propagate it somehow as its rare as hens teeth around here and I have a friend with birch woodland. Thats work in progress. I find the Ganoderma is much denser than Formes but when thoughly dried it makes an amazing hot slow burning coal. Very useful in helping the firelighting! So now I’ve got a bit of Formes the plan is to use it as primary with the flint and steel or the fire piston then light the Ganoderma with it. I was just making a video of a time spent in the woods with my friend Noakswalker from the Wye Valley. I passed some Horses Hoof or bracket fungus on some dead birch. Not knowing fully what it was and not wanting to leave things half baked I decided to investigate further and found your article. I was looking for Fungus on Birch. I found it very useful and I am now more informed of what it is and its usefulness. My simple message is many thanks for this excellent resource namely your website. Mark. Hi Mark, good to hear from you again. I’m happy my website is proving such a useful resource to you. It is very good Paul. Have a good day. P.S I will seek to cultivate this type of tinder and will let you know how I get on. Hi Paul, another useful article. Someone on Youtube wanted to know if they had found this very fungus. So I posted this article. I trust they will find it as useful as myself and the many people in this thread. Just goes to show what happens to your articles..
Hi Paul, Thanks for sharing another valuable piece of knowledge. I never realised that this tree fungus could be used so simply, I thought that the Amadou processing involved too much to make it a “gather and use straight from the tree” resource. All the very best, Dave H (Howard 48 on Instagram). It’s good to hear from you as always. Yes, with the old flint and steel, aka strike-a-light method, processing was necessary before you could reliably catch a spark. With the larger and hotter sparks of the modern firesteel, processing is not necessary. Glad you found this insightful. Thank you for pointing out the easy way of using Horse Hoof fungus as a tinder. I’d collected two big specimens and was looking to make Amadou but was put off by all the work involved. This looks like a very useful method in the field. I will be trying this for sure. As always a very insightful and useful piece of advice. Really like your blog and videos. Thanks for your comments. I was happy to read this was useful to you. Let me know how you get on using the materials you collected. I will try this simpler method Paul. I was reminded the other day of how the damp can play a big part in tinder ignition. 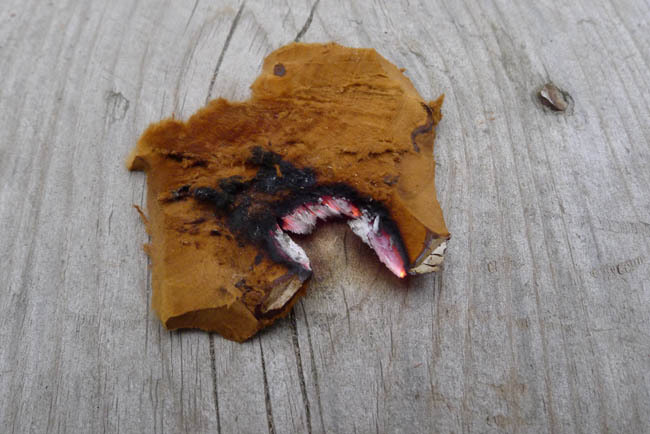 I often test myself with just birch bark, knife and ferro rod as means of initial fire making. After our very long hot summer, I recently gave it a go, after a previous days rain, it took a long time to fully ignite etc. I was aware that the bark was slightly damp, however I wanted to test myself. What I learnt that day was persistence and also to find the best (driest) tinder that you can. I do enjoy testing myself in less than perfect conditions, its great practice, if one is aware of ‘why’ its not working. Thanks for your comments. Practise is the key. Trying materials in different conditions to build up a range of experience is at the heart of the value of repeating the same simple techniques. As you mention, it also builds persistence, which is a good mental attribute to carry into the bush with you. Well done. An excellent article. I have never done the full boiling in Alkali solution method and have had many, many reliable results with the horse hoof fungus. So glad you wrote it up this way. I process the soft leathery layer out as soon as possible as the dryer the fungus gets the harder it is to slice the hard shell off. Best drying spot folks … dashboard of the vehicle … cannot be beat ! Stuff lights with all kinds of ferro, or steel/weak sparks, ~ like, ridiculous … and watch out if you want to preserve the rest of the piece – it’s hard to put out !!! Also, didn’t see it mentioned but a teased up sliver of this stuff works wonderfully in a fire piston if you’re ever into trying that … gives you plenty of time to transfer the small smoldering bit to a bigger ‘carrier’ and then to the bundle. Folks, use this stuff, it’s great, and it saves the true tinder fungus (Chaga – conk) for more worthy tasks than lighting fire. The medicinal properties of a true Chaga far, far, outweigh it’s fire starting properties, and it is so much rarer. ~ Upstate NY … Live Life Outdoors!